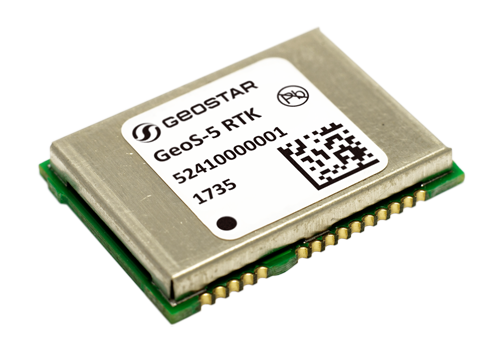 The GeoS-5 RTK is based on high performance G5 GNSS engine with integrated GeoStar’s Real Time Kinematic (RTK) technology. GeoS-5 RTK provides GNSS position with sub-decimeter accuracy using phase measurements of GPS and GLONASS signals. Integrated GeoStar’s RTK technology introduces the concept of differential positioning of moving GNSS module with few cm-level accuracy - "Rover" (GeoS-5 RTK) relative to the fixed GNSS module - "Reference station" (GeoS-5 RTK or data from high-precision network). The Reference station sends RTCM corrections to the Rover via a communication link (Wi-Fi, Cellular, UHF Radio) enabling the Rover to output its position relative to the Reference station down to centimeter-level precision. GeoS-5 RTK is ideal for those high precision applications where customer doesn't need to use excess functions of geodetic-class equipment for which he has to pay, such as: Precision Agriculture, UAV, Unmanned vehicles, Machine control, Monitoring systems of geodynamic processes. Communication with the module is accomplished through a dual serial interface (DUART) that supports GSN binary, NMEA 0183 v4.10 and RTCM v3.2 data protocols. Modules are offered in 22.1x15.9 mm 30-pad LCC package. Integrated RTK technology and GeoS-5 RTK GNSS module designed under support of Skolkovo foundation.